The technology and entertainment platform known as DragonBlogger.com become 10 years old this year, 10 years is a long time to be the owner/creator of a blog with all it’s social media channels and if it wasn’t for my awesome contributes and friends then this site and especially the YouTube Channel wouldn’t nearly have as much content, product reviews and other useful information for readers. 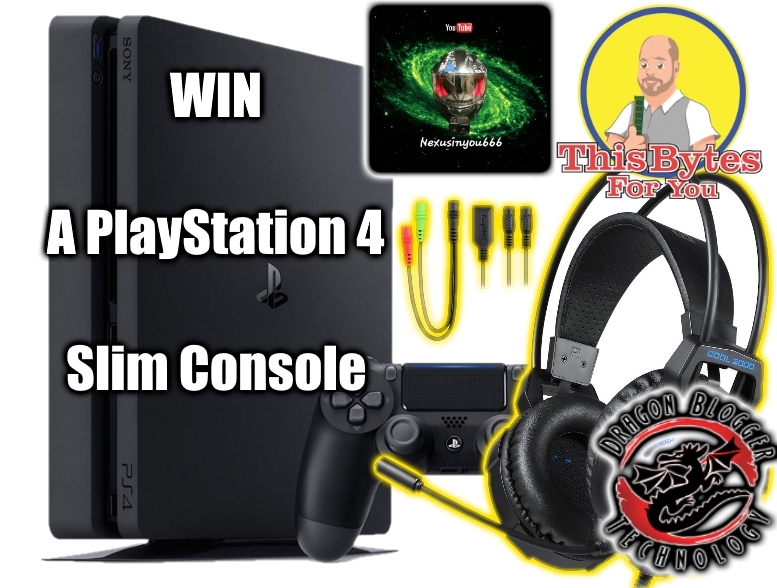 To celebrate our 10 year history we have decided to host one of the largest giveaways over the past years, this is a chance to win a full PlayStation 4 Slim 1TB Console system and you will get an EasySMX Cool 2000 Gaming Headset with it. Now, the only thing I didn’t get enough funding and sponsorship for was a game (yet) so I am still working on sponsorship and funding to ensure I can give a PS4 game away with the PS4. To help me make this happen all you need to do is complete as many actions as you can in the giveaway, and reach out to any gaming brands you know. So the EasySMX Cool 2000 Gaming Headset I am giving away is a spare unit that I was sent to review, so it is unopened and this is the unit I am shipping to the winner. This is why if you enter Internationally you don’t get the headset ARV in the prize cash if you choose the cash option instead of the actual PS4 Slim prize. Note: As with most of my giveaways you may enter from outside the U.S.A. if you are over 16 years of age, but I can only ship the prize to a U.S. address so therefore if you win you have to provide a friend or contact in the U.S. to receive the prize. Alternatively for this giveaway only, I will PayPal you approx retail value of the PS4 Slim as I plan on purchasing it on Amazon.com during either Black Friday or Cyber Monday. So the best deal I can find is the approx retail value of the PS4 Slim console. If you can’t receive PayPal for some reason, I am open to another way to receive the prize and we can negotiate it at that time. Please note: The winner of this giveaway will be announced in the December Newsletter they will be contacted a few times to claim the prize but if the winner does not claim the prize within 7 days (giving extra time due to the holiday season). Then a new winner will be chosen and the original winner will forfeit the prize. This giveaway is also co-hosted by ThisBytesForYou and NexusInYou666 make sure if you enter the giveaway you cut/paste the URL for this page when it asks you “which site did you enter from”. That way we can get credit for co-hosting the giveaway and have our chance to host the winner and win a cool prize ourselves. Tip About this Giveaway: So there is a very specific ROI (Return on Investment) needed for this giveway that we are hoping to achieve and to help justify the cost of the prize. So in this giveaway you will see 2 watch a video entries, to incentivize you to complete these entries, I have awarded 10 entries per 1 minute video length, so you get 80 entries for watching the 8 minute video and 40 entries for watching the 4 minute video. These are daily entries, so you can come back every day and watch the same videos and get those giant bonus pool of entries. You increase your odds dramatically in this giveaway if you bookmark this page and perform the video entries everyday as you can earn +120 entries per day by doing the 2 video entries per day, this would give you thousands of extra entries and greatly increase your odds. The people most committed to doing this are the most likely people to win. Also, there is a reason for this, YouTube Monetization rules require X amount of hours watched before channels can monetize, so these video entries will help my partners be able to monetize their YouTube Channels, this is why the watching video entries are so important and have such high rewards for this giveaway. Also, the more turnout we get and the better ROI for our sponsors the more sponsors/brands we bring in which means more giveaways and bigger prizes for future giveaways.